Personalized coolies keep your drinks cold and your hands dry. 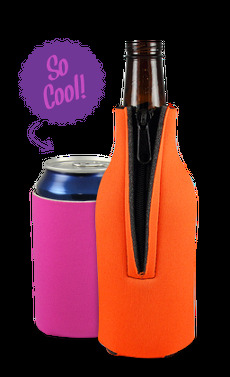 Koozies are perfect for promotional campaigns, parties, picnics, and weddings. Can holders are fixed with a solid, glued-in bottom, ensuring zero leakage and full insulation. Designed for 12 oz. cans or bottles and made with our thickest, high-quality neoprene material. Easy designing and ordering, and really fast delivery - they are already here and we love them! Thanks for all your help Ryan!! My Koozie's came out AWESOME and that was due to their graphics person telling me my choice wasn't that great. So happy he said something. We live on the lake and you can never have to many. Great company; great product - I would definitely recommend.